Villa Elena is a lovely restored farm house set in the beautiful Cagemi valley overlooking the Tyrrhenian Sea. The villa is a short drive to the historic town of Caccamo that contains the greatest castle (1160 A.D.) of Sicily and one of the most majestic of Italy. Caccamo has lovely restaurants and friendly locals. The historic city of Palermo and the charming town of Cefalu' are a 30 minute drive. This is a perfect area for artists, walkers and mountain bikers. There are beautiful family beaches nearby for a swim. The villa has four bedrooms, two baths and a newly renovated pool with wide steps to sit and relax. There is a large terrace that has cozy sofas, sitting for ten, and an outdoor barbecue area and kitchen. There is an amazing sea view from every window and terrace. Come and relax and enjoy the land of sunshine - Sicily! Newly installed very fast Wifi! Please only smoke outside. Make sure you dispose of cigarettes in pots as a safety precaution. Although children are welcomed, the property is not suitable for very young children. They would require constant supervision as the house has some unfenced high areas including the open roof. The 1st level of the house consist of the kitchen, lounge, bathroom, 1 double and 1 single bedroom. The lower level of the house is accessed via an external stairway from one side or a pathway on the other and has 2 double bedrooms, a bathroom and room for a cot. There is a large BBQ terrace, large pool area, and a covered terrace outside the kitchen with a table and chairs. There also is another large terrace leading form the kitchen with with a washing machine and a sink. Lovely villa with stunning views all around. and plenty of towels. Would definitely stay here again. The villa was lovely with plenty of outside space with a lovely pool although it was a bit cold.My husband and I enjoyed the wonderful scenic view and the rural setting, the rooms were very comfortable and Kitchen was very well equipped, Anna met us in Caccamo and gave us a substantial welcome pack which was very generous. The location was that it was quite isolated which made just popping to the shops or out for a meal a bit of a mission, the other downside was the dogs that did keep me awake a few times barking although they were in the valley and you do get used to them. Otherwise we had a great holiday and came back very rested. Absolutely loved staying at this villa. It was our first family villa holiday and it didn’t disappoint. It was beautiful, clean, relaxing with stunning views. Pool was fabulous. Ann, Anna and Piero were very welcoming, responsive, helpful and kind. Caccamo is a 5 minute drive away. I would definitely recommend this villa and I would definitely stay here again. Fabulous, comfortable property with amazing views and every little thing we needed for our stay. Great service too from the local agents, Anna and Piero. Very well equiped and everything worked perfectly. Unfortunately the pool pump was not working and could not be fixed. This was a major disappointment and we were grateful for a reduction in the overall charge to compensate - up to a point. We also felt that at least one of the bedrooms downstairs was unsatisfactory with a noisy water pump in a cupboard off the room, and there was not sufficient clothes storage. This kitchen and barbecue were well-stocked. 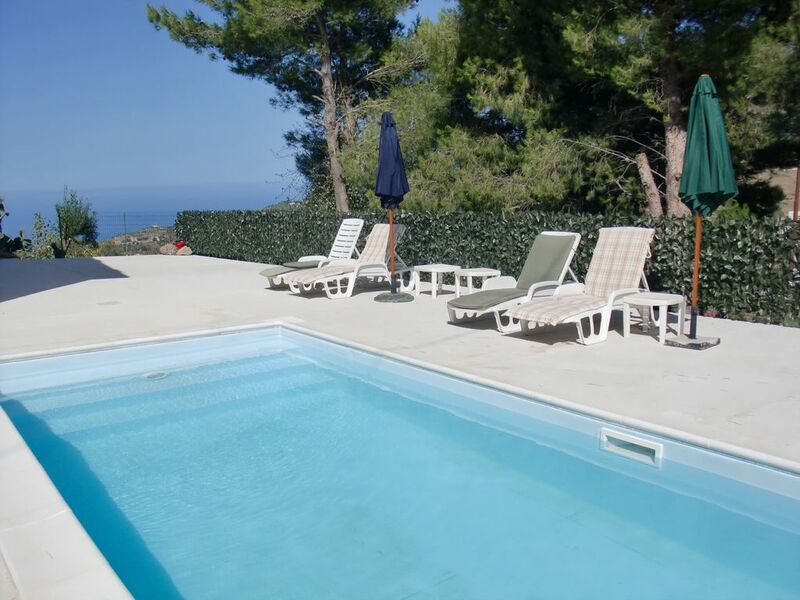 Lovely 4 bedroom 2 bathroom house located near the historic town of Caccamo. Near large lake and castle. Lovely restaurants and friendly locals. Close to the Historic City of Palermo and the charming town of Cefalu'. Perfect area for Artists, Walkers and Mountain Bikers. Lovely family beaches nearby. 3 double, 1 single bedroom, 1 cot. 6x3m swimming pool with large sunbathing area for loungers. BBQ terrace with seating for 10. Romantic roof terrace. Covered outside terrace with large table and chairs. Fully equipped kitchen and comfortable lounge with 2 large sofas and fireplace for cosy winter breaks. Located in the mountains with amazing sea views. Close to Caccamo and Termini Imerese. Not suitable for very young children due to open boundary and roof. Not suitable for disabled due to many steps. Car necessary. 2 of the bedrooms and 1 bathroom are on the lower floor of the house and are accessed via steps or path at sides. A deposit of 100 Euro will be required for each booking and a 28 day notice required for full deposit in the event of cancellation. 100 Euro damage deposit is required on collection of keys and refunded on return. We do understand accidents happen, so please inform property management team of any damages or breakdowns so they can sort it out.